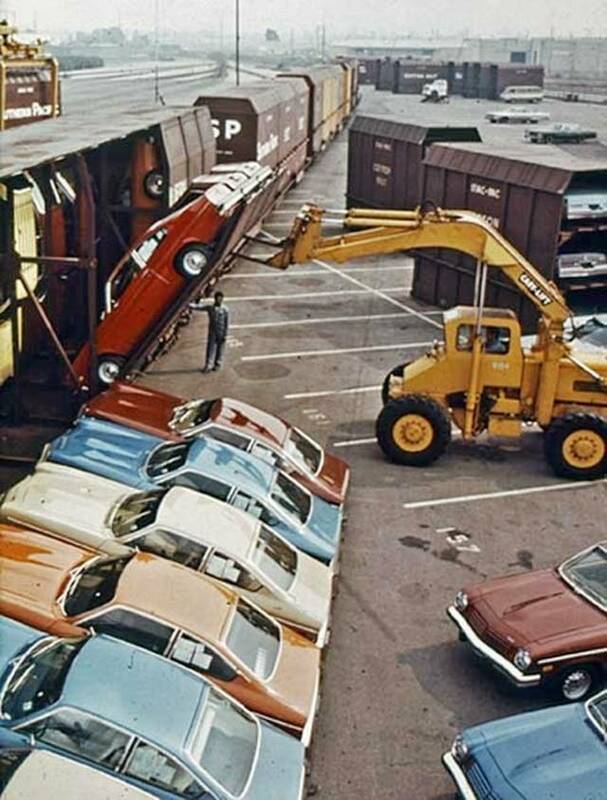 Until the early 1960s, automobiles that were moved by rail were carried in boxcars. These were 50 feet long with double-wide doors. Inside were room for four full-sized sedans on a two-tier rack - two raised up off the floor on a steel rack and two others tucked in underneath them. This protected the cars during transport but wasn’t very efficient has the weight of four vehicles was far less than the maximum weight a boxcar that size could carry. 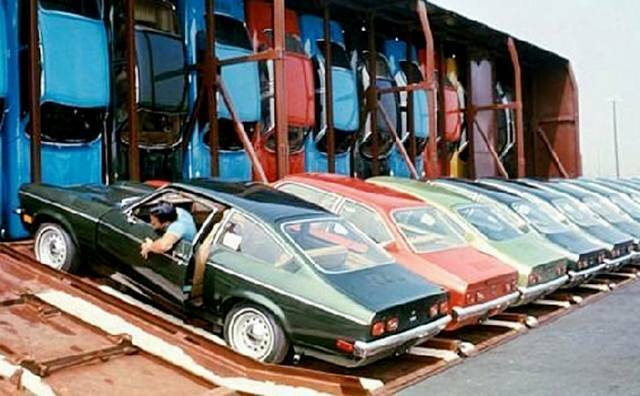 When 85-foot and 89-foot flatcars came into service, it was possible to pack a total of fifteen automobiles in one car on tri-level auto racks. But it still didn’t exceed the maximum allowable weight for each flatcar. When Chevrolet started designing ‘Vega’ during the 1970s, one of the main objectives was to keep the cost of the car down around $2,000 in circa-1970 dollars. At the time, the freight charge for moving a loaded railroad car from the Lordstown assembly plant to the Pacific coast - the longest distance that cars produced at Lordstown would need to travel - was around $4,800. 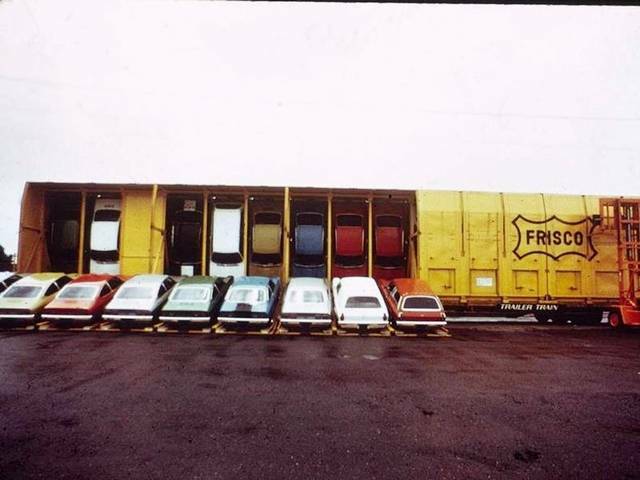 Since the Vega was a subcompact, it was possible to squeeze three more cars on a railroad car for a total of eighteen, instead of the usual fifteen. But that still worked out to around $300 per car – a substantial surcharge for a $2000 car. If only Chevrolet could get more Vegas on a railroad car, the cost per unit of hauling them would go down. The engineers at GM and the Southern Pacific Railroad came up with a clever solution. 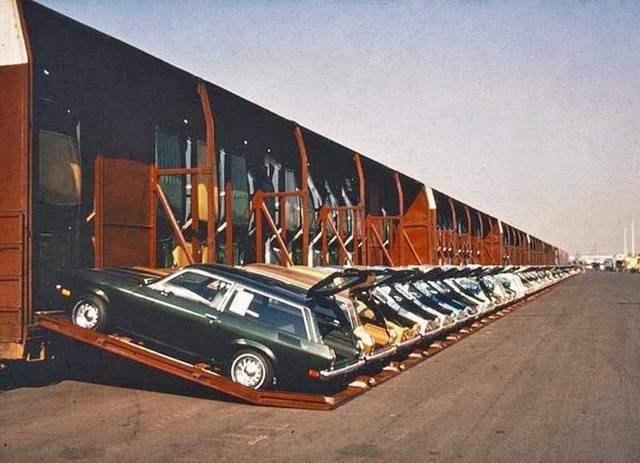 Instead of loading the cars horizontally, the Vegas will be placed vertically on a specially designed auto-rack – the Vert-A-Pac. Within the same volume of an 89-foot car, the Vert-A-Pac could hold as many as 30 automobiles instead of 18. Chevrolet's goal was to deliver Vegas topped with fluids and ready to drive to the dealership. In order to be able to travel nose-down without leaking fluids all over the railroad, Vega engineers had to design a special engine oil baffle to prevent oil from entering the No. 1 cylinder, batteries had filler caps located high up on the rear edge of the case to prevent acid spilling, the carburetor float bowl had a special tube that drained gasoline into the vapor canister during shipment, and the windshield washer bottle stood at a 45 degree angle. Plastic spacers were wedged in beside the powertrain to prevent damage to engine and transmission mounts. The wedges were removed when cars were unloaded. The Vega was hugely popular when it was introduced in 1970 however it quickly earned a reputation for unreliability, rust, safety issues and lousy engine durability. 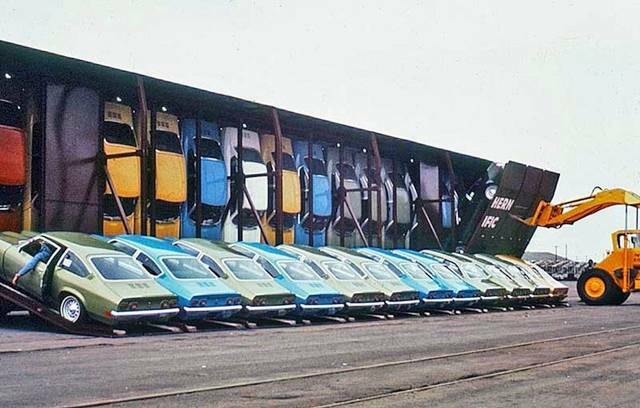 When the Vega was discontinued, the Vert-A-Pac cars had to be retired as they were too specialized to be used with anything else. The Vert-A-Pac racks were scrapped, and the underlying flatcars went on to other uses.